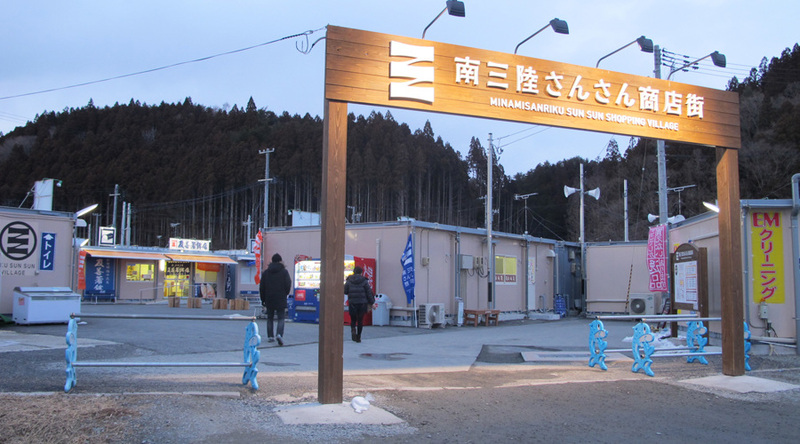 Minamisanriku is the name of the new city created in March 2006 out of the amalgamation of Utatsu town and Shizugawa town. But as the two remain fairly distinct entities we will describe them separately below. If you are looking for the beating thriving heart of Miyagi, look no further. Maps unfortunately favor such places as “Sendai” or “Kesennuma”, but the real action is hidden away in this South Third Bay (Minamisanriku). One of the millions of ways, in which Minamisanriku/Utatsu rocks, is the one and only world famous fossil museum. This one massive room is dedicated to a large black fossil of such international importance that the exact significance of it escapes a dolt like me. This is a must see for all prehistoric organism fans. (Side Note: They serve excellent, cheap oysters in the adjoining restaurant/store). If your brain is going to need a break after that intellectual exercise, Utatsu also offers excellent recreational facilities. The Heisei no Mori Sports complex comes with a soccer field, baseball field, tennis courts and a gym. It is a mere 200-yen for admission into the gym and in return you get a pure athletic experience. And if you want to take your new buff body out of the gym, there is always the challenge of Mt. Tatsugane. Mt. Tatsugane offers hiking, camping and mountain bike trails, plus a beautiful view of the ocean. Can “Sendai” offer you that? If you think you are ready for the mindaltering experience of Minamisanriku/Utatsu, follow the signs on Route 45. It’s waiting for you. restaurants. Café G, next to Hotel Kanyo on Route 45 also overlooks the bay and has outdoor seating, a pool table, great music and food. Ally Oop, next to the station, is a trendy Western-style bar, worth a visit just for the ultra-violet lit, karma-sutra filled toilet. For a mix of Western, Japanese and Chinese food, go to Taki, where they sometimes put Pocky in your drinks. On the edge of town, the Bayside Arena offers tennis courts, volleyball, badminton, table tennis and a gym. Also, visit the Sun Sun Shopping Village for a variety of food stalls and restaurants. The Bayside marathon is run though town every November. Kenz is the local, heinously over-priced video rental shop, but it also offers a fancy-dress print club for those rainy days. In the evenings, classes in Japanese, Judo, archery and some strange form of dancing can all be yours. For some great views, follow the 398 towards Ishinomaki, where you will come across the local tourist spot Kamiwarizaki, a corridor between the rocks.